A very Happy New Year to all 'Love Gardening!' friends across the world. Thank you so much for all year kind comments over the last year. I trust 2019 will be a great year for everyone, too, with lots of interesting projects – large or small – in the garden. This time of the year (if you're a hardy soul), and through into early spring, are ideal times to be thinking about construction projects in the garden, mainly because the plants are dormant (so we can see what's going on), and delicate stems and flowers are not as easily damaged. 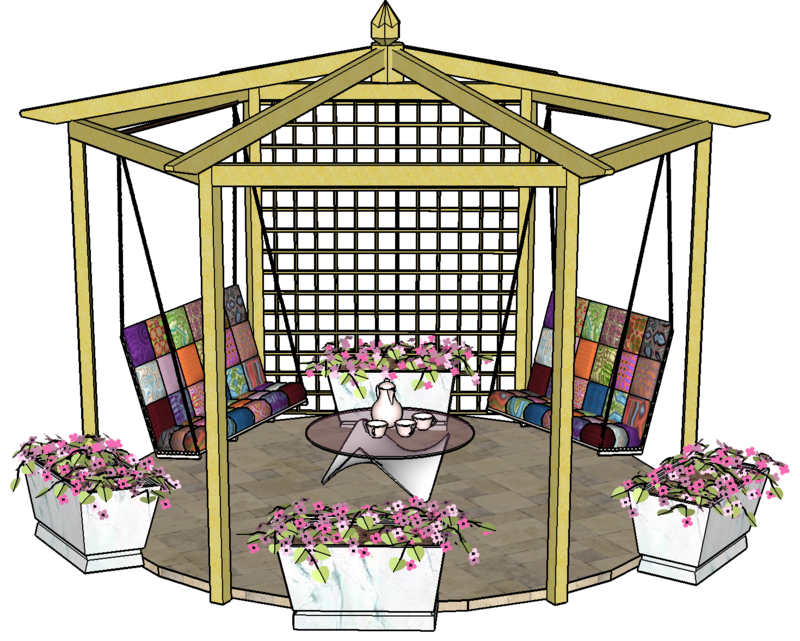 Today we're going to be looking at how to make a truly stunning and cosy pergola seating area using swing benches, ideal for entertaining and relaxing. Because of the weight of the swing benches, and the weight of the people using them, there are some aspects of this type of pergola we need to consider before construction begins. Brian asked about using them with his hexagonal pergola plans. These lovely seats can be used with any style of pergola, and I've included lots of ideas to think about, with pictures for inspiration, trying, as far as I can, to include any related links to pergolas or swings, as these are my most asked questions - where do I find these pergola products and accessories? They can also be attached to a lean-to pergola, a traditional pergola or, more commonly, arbours. At the moment, they only include UK manufacturers or outlets, but it is fairly easy to find products in other areas, where there is a generally a wide range of choice, certainly much more over the last few years. Remember to send in pictures of your garden projects! Talking of gardening on a shoestring, I have an interesting ebook that you may be interested in with lots of ideas on ecological, money saving gardening tips. People are always asking me about frugal gardening ideas - after all, we do love making something out of nothing. We'll have a look at it next time. Most people who get overwhelmed by their gardens are battling constantly with weeds. Let's find out how to manage them, so they are not such a never-ending problem. If there is anything you would like help or advice with through the ezine, just drop me a line. We have a lot of new members since last time, so introduce yourself. Let us know how you are getting on in your garden, your successful projects - pergola, or otherwise. You can even write your own web page here on this site and tell us all about it, with before and after pictures if you have them. Sloping Pitched Roof Hexagonal Pergola PlansNEW! If you think you may have a friend who would also like to read the 'Love Gardening!' ezine, all they need to do is fill in the sign-up form here to have it sent automatically. Occasionally, I receive exclusive voucher codes from UK companies. I will pass these on to you, so that you can receive these discounts too! They can be found here, or from links on my blog page. Have great fun this gardening season!